The Horrors have built a career on shocks. It seems like a lifetime ago that I came across five ghoulish faces staring back at me from the cover of NME in 2006. The Horrors had been playing shows a matter of months and yet they were already deemed exciting enough to warrant an NME front page. With their comic names (Faris Baldwin became Faris Rotter), nightmarish costumes and bizarre stage antics, The Horrors provoked reaction with just about everything they did; except that is the music, a thrilling strain of garage rock which got completely overlooked. Three years later it was the music that shocked when in 2009 they released ‘Sea Within A Sea’, a stunning, kreutrock epic that erased any notion of The Horrors as all style and no substance. 2011’s ‘Skying’ was another interesting left-turn, into a murky realm where Synth Pop and Shoegaze cross pollinated. It certainly wasn’t as strong as 2009’s ‘Primary Colours’ but it was another excellent album that surprised a lot of people. I’ve spoken to people who are interested in this record only in so far as it can provide another shock. Those people are going to be disappointed with ‘Luminous’, as it’s virtually the identical twin of ‘Skying’. Sadly the band are ploughing the same ground with diminished rewards. The big difference is that where that album had guitars that sounded like guitars and synths that were made to sound like guitars, this album has synths that sound like synths and guitars that are made to sound like synths. It’s a fine distinction, but an important one. The relegation of the guitarist Josh Hayward and the promotion of Synth wizard Tom Coward means that this is a rather tame album compared to its predcessor. The Horrors attitude and commendable ferocity has always been initiated by the throbbing axe-work of Hayward. Here he sounds relegated to a bit player. Compard to ‘Skying’ and certainly ‘Primary Colours’ and ‘Strange House’, This is the sound of a neutered band. It’s music for scientists made by scientists. Music that makes half-hearted gestures to the dancefloor but never works up enough groove or energy to coax you there. It’s music that expands, revurbarates, wanders and prods – but never connects. This is asexual music made by men who spent far too long in the studio and not enough time with the groupies. It’s music that is very clever, and don’t the band just know it. They want your plaudits and not your blood or your sweat or your tears. Faris’ lyrics, whilst never complex or particularly insightful, have always been heartfelt and purposeful. For whatever reason, they aren’t doing it for me this time around. At best, his vague musings on love offer simple rewards, in that they melt quite nicely in to the background, keeping your attention fixed firmly on what he thinks matters – the music. They aren’t however an attraction in their own right and because the band excel in so may other ways, it’s one thing holding them back from greater heights. But this isn’t a bad album; in fact in certain respects it’s astonishing. Sure It’s a mildly boring, long, heavy record with very few moments of levity or drive- but it sounds better than any other album I’ve heard all year. The textures are exactly how the band describe them – luminous. The songs are so dense and layered with glorious sounds that you know have been slaved over and have turned out just so. ‘I See You’ builds and builds like it’s aiming for the heavens, in a glorious reverse of ‘Sea Within a Sea’s’ epic descending collapse. ‘Sleepwalk’ is the exact musical equivilant of sleepwalking, and regardless of whether that is something you want to hear, it’s a commendable sonic achievement. From the swirling reverb of ‘First Days of Spring’ to the twangs of ‘Change Your Mind’, this is a perfectly realised soundscape. But that doesn’t autmoticlly make for a great album. Thing is, the album also sets a lot of store in the strength of the choruses, only they aren’t all that mememorable. In fact The Horrors have been regurgitating the same melodies for years – ‘I See You’ is basically ‘So Now You Know’ which is basically ‘I Can See Through You’ which is basically ‘Who Can Say’. All fine and good, but we’ve heard it all before. The moody ‘Change Your Mind’ however has noprecedent in the band’s discography and the poppy ‘Falling Star’ also breaks new ground for the band. On both these tracks it’s the melodies that drive the songs forward, they don’t feel like an afterthought. For me, that’s always the best way to craft a song. 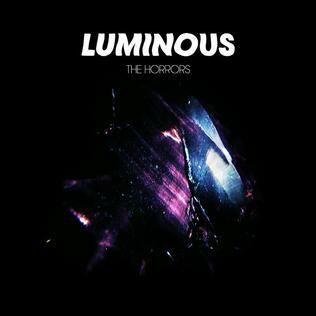 ‘Luminous’ is not a disastor but for fans used to reinvention it’s quite a comedown. It’s shocking for it’s lack of shocks. It worries me that the band are moving further away from the spontenaious energy of their early live shows and recordings towards an increasingly sexless and air-sealed sound. The Horrors are gifted musicians and experimental tecnicians and that strength shines here, but they’re also capable of being wild and eccentric, a side to the band that just isn’t represented on ‘Luminous’. For a band used to taking big steps forward it might be worth taking a couple of steps backward to remember where they started – as five ghoulish faces with hunger, attitude and energy to burn. The Horrors change their sound more than they change their clothes (which is saying something) so it’s no surprise to find that third album ‘Skying’ is quite a bit different to its renowned predecessor ‘Primary Colours’. Having emerged in 2006 as garage rockers, they found more success once they traded in their organ for a synth. The resulting album was an astonishing blend of prog, shoegaze and synth pop and it made them the Susan Boyle of indie – ‘Primary Colours’ was the amazing album that nobody saw coming. As I say, third album ‘Skying’ is a different beast altogether, but it feels like a natural progression rather than another grand departure; It’s brighter, it’s bigger, and it’s more ambitious. Track one, ‘Chainging The Rain’, opens with a baggy drum beat and shaking maracas – from the off it’s clear that this album has a lot to thank the early 90’s for. Baggy is the word that keeps cropping up when I think about ‘Skying’, and though it’s not a genre that gets a lot of love these days, The Horrors remind you why it was so popular in the years before britpop. Here the rhythms are funky and high in the mix whilst the vocals are heavy with effects and low in the mix. At first it’s a little jarring, records aren’t really mixed like this nowadays (especially albums that go in at number 5 on the album chart) but after a while you get used to the sound. Track two, ‘You Said’, begins simply with a seductive keyboard and Faris in whisper mode; earlier this year his side project Cats Eyes released their excellent debut album and whilst there is little to connect the two records, Faris has clearly learnt the art of restraint and composure from his other band. ‘Primary Colours’ was at its weakest when Faris reverted to shouty mode, and thankfully he never makes that mistake here. In fact the whole band are much more restrained and composed, something that I like but also slightly regret – only the excellent ‘Monica Gems’ (a Villiage Green era Kinks tribute) gets loud and dirty, which is a slight shame as The Horrors used to be a brilliantly ferocious live band. But the transition may just be worth it as it leaves us with numbers like ‘Endless Blue’, which begins with (dare I say it) a space jazz intro before bursting into a Joy Division-esque, post punk rocker where Faris’ slightly distorted vocals hover below feedback and horns. Speaking of which, the horn section makes a reappearance on first single ‘Still Life’ which sounds like the obvious next step on from the likes of ‘Who Can say’ and ‘Whole New Way.’ For all the backward guitar loops, trance bass lines and hazy vocals, this is essentially synth pop at its finest. But whilst The Horrors have clearly moved on there are still hints of where they come from. With its loud/quiet dynamic and organ riff, ‘I Can See Through You’ sounds most like The Horrors of old, indeed it’s possibly the only song they’ve ever recorded that would sit comfortably on any of the band’s three albums to date. One member of the band (I forget who) is the elder brother of Freddie from The Vaccines. When commenting on the difference between the two bands, Freddie said something along the lines of ‘They start with sonics and we start with songs.’ It’s an obvious distinction to make; ‘What Did You Expect From The Vaccines’ was a minimal pop punk album, but even at their most minimal, The Horrors layer their music with effects and reverb. Just occasionally this results in songs that aren’t fully realized as songs – it’s as if they said ‘how can this song benefit the sound’ rather than ‘how can this sound benefit the song.’ Therefore we are left with the technically ambitious but rather lightweight ‘Dive In’, and the even more pondrous ‘Wide Eyed’, both of which are essentially mid-paced psychedelic jams. But then Skying is a typical psychedelic record; when it’s good it’s very good and when it’s bad it’s downright bizzare. The lyrics on ‘Skying’ are generally quite strange, vague and unmemorable (lots of talk about floating, seeing vivid colours and loosing touch with reality) save for two or three excellently executed songs about longing and nostalgia (one of which is the epic eight minute finale ‘Oceans Burning’, the album’s best moment). Musically as well they sometimes skirt a bit too close the edge of what is acceptably trippy and indulgent, which leaves me feeling that overall ‘Skying’ is not as successful as ‘Primary Colours’ (an album rooted more in reality). But such is the way with bands that push the boundires, you win some, you loose some, and in fairness The Horrors win a lot more than they lose. I guess it was always going to be hard to follow-up one of the best albums of recent years and the band certainly haven’t let anyone down; ‘Skying’ is an accomplished, ambitious and at times stunningly well made album.